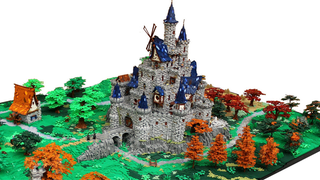 The quirky rooftops, the unique color palette and the giant windmills make César Soarez’s and Hugo Santos’ massive 500,000 piece build not just a generic medieval fantasy set, but rather something like a scene cropped out from an 80s or 90s anime. There’s so much going on it’s really easy to get lost in this forest. The giant castle is surrounded by tower ruins, a small village, cottages and a small river. It has 6 by 14 Baseplates (48x48 studs) and my estimation is that it has more then 500.000 parts. Every single Baseplate has some texture and elevations and many are elevated 10 or more bricks to give more sense of depth. The landscape came out a little poor as I ran out of parts for trees and vegetation. I would have liked to give it a sense of a more thick and full forest, but it was not possible. Also, my intention was to put a lot more minifigs, specially on the village center with more activity situations, but I just didn’t have the time. Here are some highlights below. Check out the creator’s Flickr stream (via EuroBricks Forums) for more and for hi-res pics.